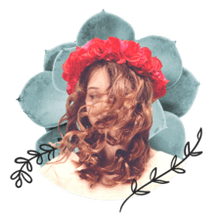 Whether you're going for beachy waves or bouncy curls, there is nothing more frustrating than spending hours primping those curls only to have them go limp and flat after a few hours. With the right products and tools, you can kiss curls that fall apart ​goodbye and say hello to curls that stand the test of time! When you want to wear curls or waves on freshly washed hair, a heavy shampoo and conditioner will weigh your hair down. Try a light moisture shampoo and conditioner (Nexxus Hydra-Light is one of our favorites) that will leave your hair feeling lighter without drying it out, and you'll have a great start to take on the curls. If your hair is on the dry side, a more hydrating shampoo and conditioner may be in order. Before you blow dry you'll want to make sure your hair has equal parts hold and anti-frizz for curls that don't get fuzzy. A curl enhancing product comes highly recommended for pre-drying hair prep. We absolutely love TIGI's Catwalk Curls Rock Amplifier because it gives hair a touchable hold. Drying your hair with a diffuser will help enhance the natural body in your hair (you may discover you have more than you ever thought) and it will help reduce frizz. For extra volume, dip your head upside down while you blow those locks dry. It's also a good idea to scrunch your hair as you dry if you like a beachy look. Most hair dryers come with a diffuser these days, but if not, you can purchase a diffuser to fit your hair drier. One of our most effective hair curling tips will have you skipping the shampoo and hair dryer altogether (just don't skip the shower). Believe it or not, dirty hair can hold a curl better than squeaky clean hair and it'll save you a lot of prep time, too. Have dirty hair without greasy hair by using a dry shampoo like Redken's Powder Grip Hair Powder. If you've never used a setting spray to lock in your curls, you're missing out on the key to long lasting waves. Many setting sprays will also offer heat protection, which is great for minimizing heat damage that a curling iron can cause. Biolage's Thermal Active Setting Spray by Matrix is a long time favorite for curls that go the distance. Don't have a setting spray? Hair spray works great to help set curls. Simply spray on your hair before you curl or set in hot rollers. If you're still using that old curling iron circa 1991, it may be time to upgrade to ceramic or tourmaline. The new material technology in curling irons delivers effective, consistent heat that will curl your hair from the inside out. The result: beautiful, long-lasting curls and less heat damage than that ancient metal curling iron that's scorching your hair. When curling your hair, take your time. Curl your hair in small sections, starting at the nape of your neck, and pin the rest of your hair up with a clip on the top of your head. Take small sections down as you work your way to the top of your head and allow your curls to cool completely before styling. One more curling tip: use a slightly smaller curling iron than you usually do for a longer-lasting curl. If your hair is fine, limp, or otherwise refuses to hold a curl, hot rollers may be a better option than a curling iron. You will likely want to practice setting your hair in hot rollers before any big event to make sure you get those rollers set so your hair is beautiful after. Let the hot rollers sit in your hair for a minimum for 10 minutes—even longer if you have extra time. And hey, while your hot rollers are sitting, it's a perfect time to apply your makeup! So, we understand that soft, touchable curls are ideal, but if you have trouble getting curls to hold and you want them to last all day, you are probably going to have to forgo the touchable light finishing spray, for a hairspray that will work hard to keep those curls in place. This doesn't mean that you have to have a helmet head of hard curls, but finishing off your style with a firm hair spray can mean the difference between two-hour curls and days of long-lasting curls. Our favorite finishing spray is CHI's Enviro Flex Firm Hold Hair Spray. You'll love the hold, the smell, and most important, the shine delivered by CHI's hair spray!